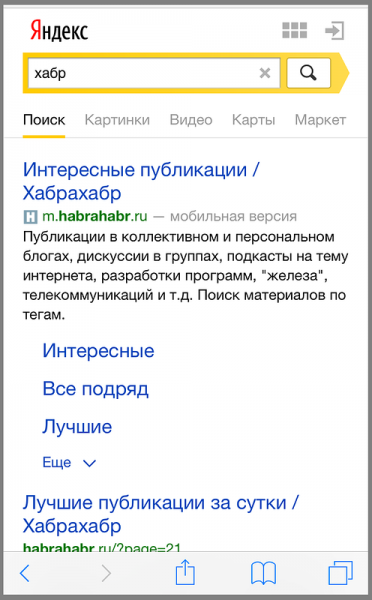 On Friday, Yandex announced that it is marking mobile friendly pages for mobile search. In the coming weeks, users in Russia, Ukraine, Belarus, Kazakhstan, and Turkey will notice a mobile version label next to listings of webpages with mobile design or separate mobile URLs. Yandex will automatically substitute links to the mobile version- so that site.ru will be m.site.ru. Thanks to Maxim Borisov and Sergey Korsakov of the Yandex mobile search team for taking the time to explain the details behind this for our readers. First of all, to those wondering why the update is happening now, Maxim and Sergei explained that the update was in the works this spring and that Yandex is ahead of the curve when it comes to the way users behave. Right now 25.8% of Yandex’s search traffic comes from mobile devices, which is up 5% since last spring. It was 23% in Q3 2014 and 20% in Q2 2014. For curious minds, Yandex’s search share on Android is 45% and 40% on iOS, according to LiveInternet stats. Most users aren’t searching on mobile yet but they also aren’t used to mobile versions of websites. Less than 18% of the top 1 million websites in Russia have mobile friendly versions and about a third of the top 1000 sites have mobile versions. Due to Google’s update in April, a good amount of these top sites are international but an exact number is unconfirmed at this time. As explained by Maxim and Sergei, working with mobile sites doesn’t vary a lot and the updates include a majority of criteria that international webmasters should expect from their familiarity with the Google updates. 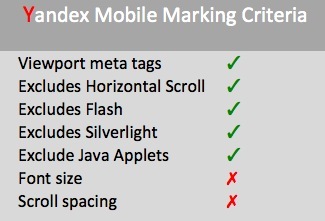 Hundreds of different factors will ultimately contribute to a site being mobile friendly. However, most importantly, mobile-friendly sites need to be adjusted for the resolution and fit of mobile screen that is easily scroll-able. As opposed to some other factors that Google emphasizes like font size and spacing with tap target/links. The viewport meta tag should be set accordingly for mobile phones, horizontal scrolling is excluded, and sites shouldn’t show users content in Flash or Silverlight. Rather, it’s suggested to use HTML 5. Additional criteria will eventually be implemented. Similar to GoogleBot-Mobile, YandexMobileBot will be crawling webmasters’ mobile sites and a new mobile ranking formula will be rolled out in the coming months. Webmasters should anticipate the crawlers to cover the vast majority of sites over the coming months and for mobile friendliness to impact their rank in the Yandex mobile search results. 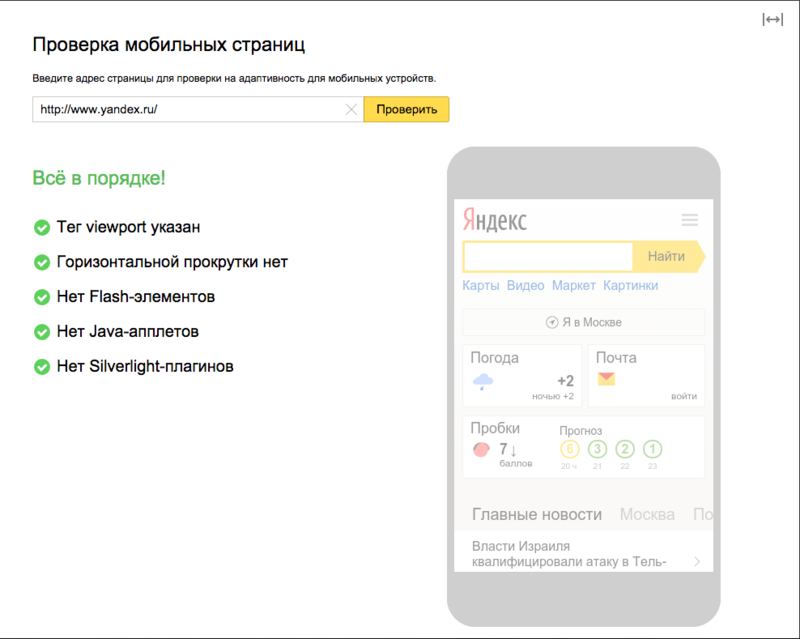 Webmaster’s have the ability to check the status of their mobile pages using the new diagnostic service in the Yandex.Webmaster toolkit. Using the latest version of Yandex.Webmaster, webmasters can check how Yandex sees their pages. By entering their URL on the “mobile check page,” a webmaster will get feedback on meeting Yandex’s requirements and can then adjust accordingly. As seen in the example below, this webmaster fulfilled content requirements for excluding Flash, Java applets, and Silverlight but still needs to adjust their viewport meta tag and that there is a horizontal scroll. The red icons with exclamation marks not only include the main issue but also a brief description for the webmaster. For instance, under the horizontal scroll issue, the note explains that the content doesn’t fit in the width of the screen causing inconveniences when using the site. After a webmaster makes the necessary changes and re-enters their URL, they can expect to see green check marks next to the list of criteria. 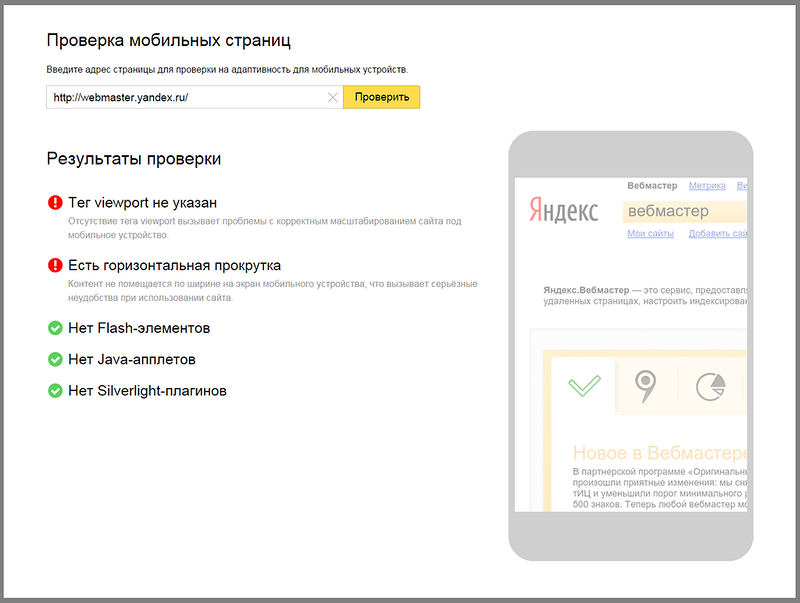 In addition to this tool, Yandex will introduce an additional tool that can be used with the “check mobile page” tool to help webmasters better understand how Yandex sees the mobile friendliness of their website. For webmasters in Russia who have already made their sites mobile-friendly, make sure to double check with the Yandex.Webmaster tool. The simple process will provide the current necessary info you need to check your pages. Since Yandex is now marking pages and has announced that a new mobile ranking algorithm will affect mobile results in the future, it’s advisable to make these adjustments now in preparation for upcoming SEO changes. As always, creating a good user experience is the goal. Russian smartphone use is expected to increase by 20% over the next four years. As more and more Russian users turn to their mobile devices, webmasters should aim to provide the best possible experience for the growing mobile Internet population. Melissa McDonald is the International Marketing Manager at Yandex, Russia's leading search engine, which offers free English to Russian translation and optimization for advertisers. Melissa also regularly blogs for RussianSearchMarketing.com, a news and information resource for digital advertising in Russia. Hi, where is this feature in Yandex Webmaster Toolbox. You state ” By entering their URL on the “mobile check page,”. I have no sections within the toolbox called “mobile check” or anything similar. Many Thanks. Hi, the mobile-friendly test is the last item in the left column. See the image below.